Kill mold with MoldSTAT Plus concentrated & EPA registered mold killer and fungicide. Kills molds (black, green, aspergillus niger & other molds), mildew, lichen, fungus and algae. 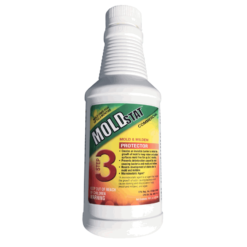 After Killing Mold on the affected area, Clean the surface mold with Moldstat Mold Remediation Products. 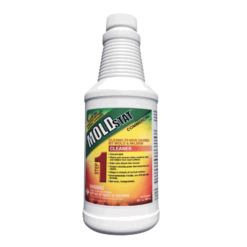 Multi-surface MoldSTAT Peroxy Kling mold cleaner removes surface mold stains while leaving a clean fresh scent. 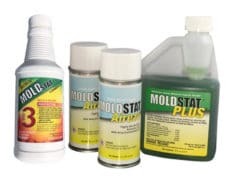 Moldstat the certified mold remediation cleaning products. Looking for a low cost way to remove mold? Choose effective Moldstat Mold Killer for Do it yourself (DIY) Flood Water Mold resolution. 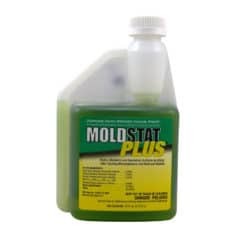 MoldSTAT Plus Coverage: 3/4 oz of concentrate makes 1 Gallon of full strength mold removal solution enough to treat 100 sq ft. This high dilution rate makes MoldSTAT Plus economical enough to use for both preliminary mold cleaning and a final soak for mold root killing. 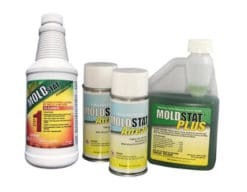 MoldSTAT Plus can be used in TWO steps of a mold removal project. 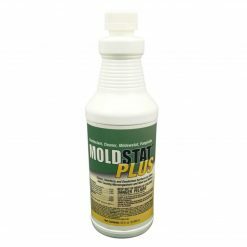 First use MoldSTAT Plus as a mold remover and cleaner to wipe away gross surface green or black mold. Second with the surface mold is removed, kill mold roots using the same MoldSTAT Plus to soak into the pores of the surface and penetrate deep to mold roots. Home Mold Removal Products that offer practical solutions for home mold spore removal.